In this week's edition of the No Jitter Roll, we look at announcements around team collaboration, contact center performance management, artificial intelligence, and collaborative workspaces from providers Microsoft, Serenova, 7.ai, and Mersive Technologies. Microsoft this week indicated it will be making available a free one-year trial of Teams for any user of Office 365 or Azure Active Directory, "even if the user is not yet licensed for the service." Microsoft will be rolling out this trial starting on June 1. According to Redmond Magazine, the capability to initiate a free trial will be turned on by default for all organizations using Office 365 services, with the exceptions being for government and education Office 365 users and Office 365 Germany. If an enterprise doesn't want to give its end users the ability to initiate free trials, enterprise IT admins will need to disable the setting within the Office 365 Admin Center. 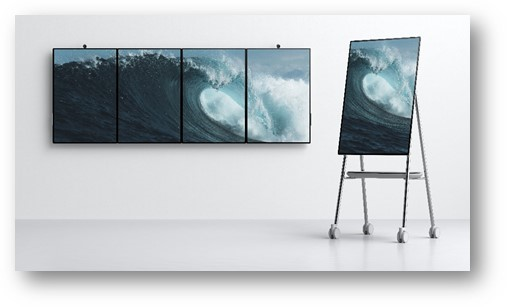 In other Microsoft news, the company this week unveiled Surface Hub 2, the next iteration of its team collaboration-focused digital smartboard, as shown below. Surface Hub 2 is deeply integrated with Microsoft Teams, Whiteboard, and Office 365, and by design, is aimed at providing a collaborative experience for modern teams that are increasingly mobile and more often working in open office settings. "There is a need for a device built for teams and designed for these new environments," Panos Panay, chief product officer, said in a Microsoft Devices Blog post. "To help people collaborate whether they are in the office, at home, or travelling the world. To move beyond just passing along information, to a world where they are collaborating in real-time, in an efficient, and intuitive way." Surface Hub 2 features a 4K+, 50.5-inch multi-touch PixelSense display that's adjustable between portrait and landscape mode, with the cameras dynamically rotating along with the device (which you can see in action via this video). It features integrated speakers and far field mic arrays to account for larger rooms. With this second iteration, Microsoft introduces tiling, or the ability to link up to four devices to create a larger canvas on which to ideate and share content side by side. The Surface Hub 2 is wall mountable or available on a rolling stand designed by partner Steelcase. Additionally, the Surface Hub 2 features multiuser sign-in, which allows multiple people to access their documents and merge their ideas at the same time. Microsoft said it will be testing Surface Hub 2 with select customers this year, with general availability planned for 2019. Serenova, a contact center-as-a-service and workforce optimization provider, this week introduced CxEngage Scoreboard, for performance management, gamification, and agent engagement. CxEngage Scoreboard, powered by workforce optimization provider ClearView, works by aggregating agent data from a variety of systems, then delivering data in real time to every agent and supervisor in a customized fashion, Serenova said. The intent is to enable enterprise contact center operations to create a culture of continuous development among staff. 7.ai, a provider of intent-driven customer experience solutions, this week released new features for its core product line and artificial intelligence-driven virtual agent called 7 AIVA, as part of its Spring 2018 Release. Specifically, 7.ai has extended AIVA's conversational and transactional capabilities to allow agents to converse with customers through Amazon Alexa and Google Assistant. "Common interaction models and enterprise integration will allow enterprises to extend an ongoing conversation through a single thread that crosses all voice and digital channels," 7.ai said in its press release, adding that these channels could include a Web browser, smartphone, or virtual personal assistant. Additionally, the Spring 2018 Release includes enhancements to 7 Chat, via a new agent console aimed at improving workflow automation and machine learning; an enhanced Content Manager, the company's self-service publishing tool for creating, organizing, and publishing AIVA content and conversational dialogues for digital and voice interactions; and a new feature of 7 Personalization that enables use of a common data source for cross-channel creative updates. Mersive Technologies, a provider of wireless content sharing and collaboration solutions, this week announced the release of Solstice Kepler, a cloud-based enterprise workspace analytics solution. Solstice Kepler provides insights about the use of meeting rooms and other office team spaces to aid A/V and IT teams in the decision-making around workplace technology and space planning. Specifically, Solstice Kepler provides meeting analytics around proactive alerts, real-time status, and usage data, for example. The analytics solution, currently in beta, is slated for general availability in June. Additionally, Mersive launched version 3.3 of the Solstice Pod software, the company's content sharing and collaboration solution for meeting rooms. The Solstice Pod software now supports 802.1x and API-based integration with room scheduling systems including Microsoft Outlook and Google Calendar.